Again, awesome work by the jQuery Team and the Triage Team. Looking forward to use 1.6, and also to see the Beta of 1.7.
i would really appreciate if PubSub would become jQuery Core, instead of a Plugin, because only then people will use it more often. Awesome. Attribute-Handling becomes finally becomes very clear. Thank you for the hard work! Great work! Thanks for this release. returns an empty string, not undefined. Additionally the checked content attribute and idl attribute are reflected, means if $.attr(input, ‘checked’) is undefined $.prop(input, ‘checked’) will be false and vice versa. I had read a while ago that Microsoft’s Templating plugin was going to be rolled into core in version 1.5… but I still do not see it here in 1.6…. is that on some kind of hold/delay ? I highly appreciate the section on breaking changes. As a developer at a company that is reluctant to include new libraries, it is much easier to get the new version out there when you include such text. Congrats!! these new features are very helpful and the improvement on performance will help to create better and complex stuff, plus with the requestAnimation animations will be better on modern browsers. Thanks!! Outstanding work, love jQuery!!!!! Great Job ! Love Jquery ! Nice summary! I noticed that code.jquery.com doesn’t have its own SSL cert and because of it, https://code.jquery.com/jquery-1.6.js and sites that use it like https://developer.yammer.com/ have a red line through https on Chrome. Stellar work, jQuery team!!! Can’t wait to test the ajax and attr improvements – you guys are AWESOME. A huge thank you for making my life better with jQuery :) You guys are simply awesome! Holy crap, <3 auto-deferreds in animations now. That is ridiculous. Great work! Thanks jQuery Team! Amazing release. Big thanks again. Thanks for fixing bug #8418! It took me two days to work around it some month ago. Uhhh. You guys completely changed how .attr(‘checked’) works?? 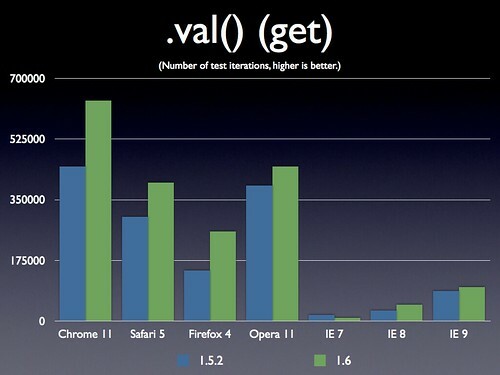 You realize how much code that’s going to break if people upgrade to jQuery 1.6? Oh man. Never mind changing the code we can easily control. Think of all the plug-ins out there that use attr() where it will now fail. Don’t get me wrong, I dig the updates, but this one scares the hell out of me. Sweet! The amount of work and ingenuity embodied inside of jQuery blows my mind. Truly, “on the shoulders of giants” is how I feel when using jQuery. Thank you! to get the current state of a checkbox? Nice to see the new version is out, looking forward to speed improvements in my code! The whole .attr(“disabled”, “disabled”) to .attr(“disabled”, true) threw me off for a bit, but it’s much better now and makes more sense. Woot! 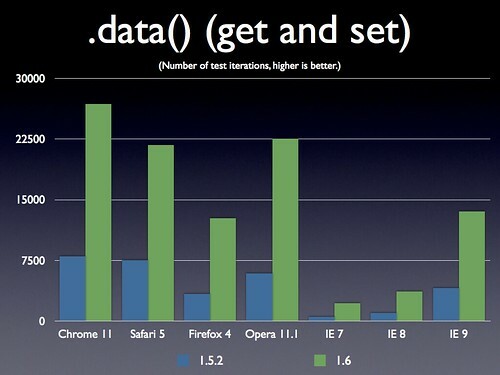 In “Performance Improvements” the benchmark use IE9 32bit or 64bit? Awesomeness!!! Thanks for all the good updates, but changing previous methods functionality/use would be a big problem for all of us. I like the fast and innovative development. It seems that 1.6 would be utilised in new projects, as .attr() would break a lot current stuff. Congratulations! And thanks for such a stellar project. Put me on the list of users who are concerned about the changes you just made to .attr(). If this break in compatibility is really necessary then I’d like to see some clear communication about why it was made. The changes to .attr() are a little hard to swallow, with all the debugging of older programs that will now be required. In the section Performance Improvements, above, shouldn’t the first chart be titled .attr(“name”) instead of .attr(“value”) ? I’m scared to have not well understood about the attr/prop change though. wouldn’t it have been more consistent and backwards compatible to keep attr having the old prop meaning, and introduce a new function name for the original html attribute. should that be .attr as written ? 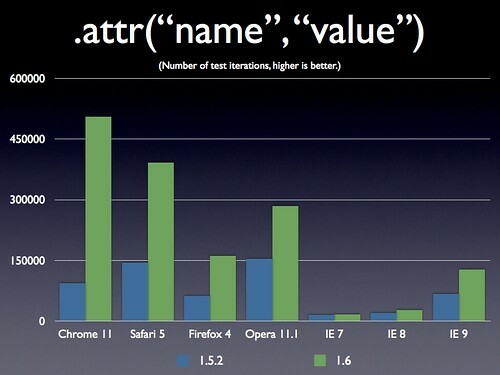 does that mean that .attr can still be changed (and that it changes .prop() but then .attr() doesn’t represent the html ? In CMSes, multiple modules rely on jQuery, and loading the latest usually works just fine. Looks like with 1.6 it will not be the case. And keep the great work going! Awesome! I start to wondering when they give us a top/left two position in animate. 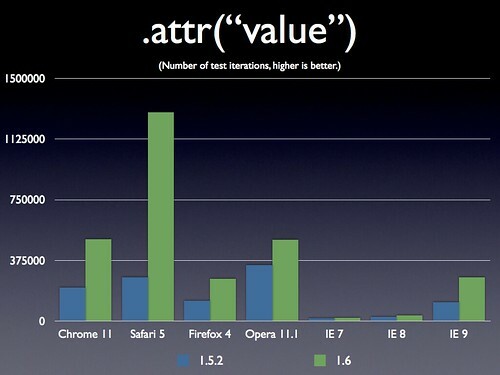 actually the new .attr() is not consistant between browsers. I have never had a release of jQuery break as many things in my app as this one. It’s really quite astonishing. I think the bulk of the errors have to do with the .attr()/.prop() changes, but I’ve also seen .offset() return null in situations where it never has before, among other things. It’s going to take me days if not weeks to get everything working again with jQuery 1.6. This is a headache I didn’t need. Nice to read about the performance improvements, just too bad about the attr/prop-changes; 1.6 becomes useless for us. If someone would put all the other improvements into 1.5.99 I would be thankful (and some others I believe). Newsflash: no one is forcing you to update right now. Does this API change on .attr() method have an effect on jQuery UI and it’s handling of UI element? Do I have to wait for an jQuery UI update that supports jQuery 1.6? Something broke with 1.6, I’m back to 1.5 for the moment. I get an error in “Line 16, Pos 11777”, but can’t yet put my finger on it. Might very well be some coding glitch in my script that some change in 1.6 has now revealed, but it only shows in IE 8 / PC so far. Works fine in Safari / Mac and Firefox / Mac (Ff/PC not tested).